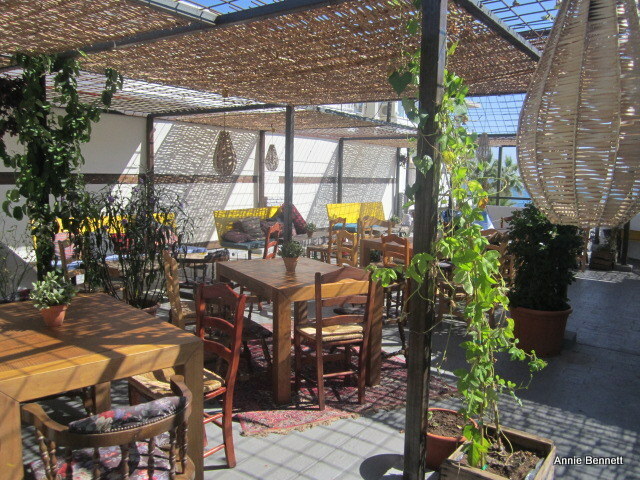 While eating barbecued sardines by the beach is one of the great simple pleasures in Malaga, it is good to see new places opening up that offer something a bit different. My friend Shawn Hennessey, who is a real expert on tapas, recommended I try Pez Tomillo, which she discovered earlier this year and was really impressed with. Set just back from the beach in Pedregalejo, about 4km east of the city centre, Pez Tomillo is a laidback restaurant and bar with a roof terrace where you could happily spend a few hours knocking back cold beers or cocktails. The menu offers modern versions of traditional Andalucian dishes with a few more farflung influences thrown in. Shawn told me that it is run by the Equipo MpuntoR group, which has a few places in Seville. A few years ago we ate at their excellent Gastromium restaurant, which was nominated for a Michelin star, but has now sadly closed. The brilliant chef there, Ernesto Malasaña, is now at the helm of MpuntoR’s Bar Antojo in Seville, and quite a few of the favourites from the menu there are also on offer at Pez Tomillo. The décor is the mishmash of rustic, boho and vintage that is so in vogue these days and works really well in this waterside location. I sat on the covered terrace on the ground floor, which was busy but not frantic on a Sunday lunchtime. The young, attractive waiting staff were really friendly and welcoming and great at explaining dishes and advising on how much to order. 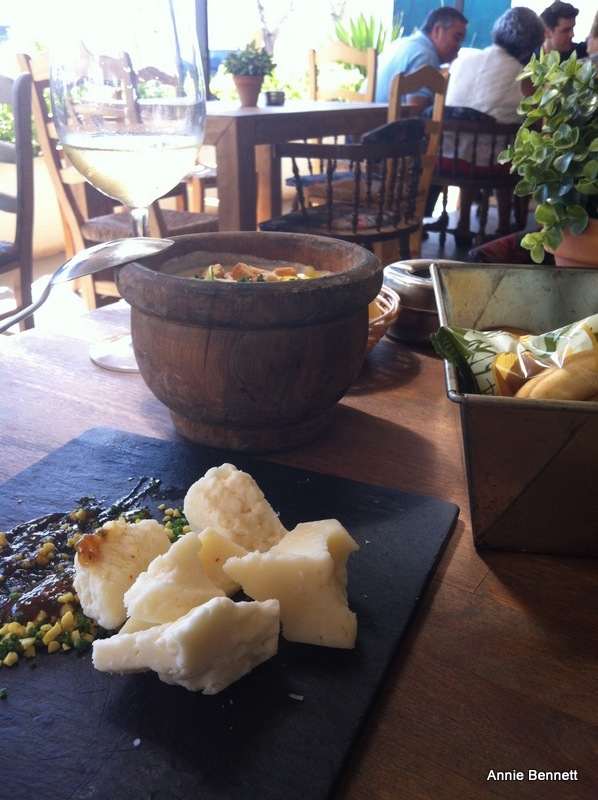 I saw they had payoyo – a hard, crystally artisan cheese made from sheep’s and goat’s milk in the Sierra de Grazalema in Cádiz – which I love, so I had to order that. I got half a dozen very chunky chunks for €3.90, which was amazing value. Most things are available as a tapa or a plato, with prices from around €3 to €10. There’s an interesting wine list too; I had a couple of glasses of Fenomenal Rueda (€2.90). I ordered ajoblanco (€3.20), the great Malaga version of gazpacho, made from almonds, garlic, bread and olive oil, which came in a big wooden bowl and was silkily exquisite. 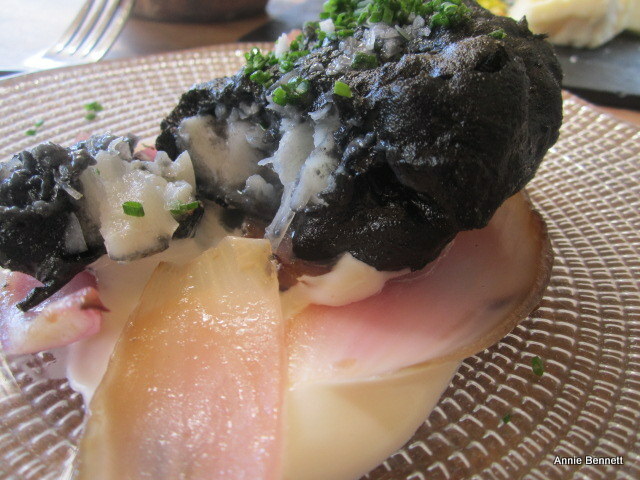 The star dish was however the carbón de bacalao, a lovely piece of salt cod in a black squid ink batter – again, tremendously good value at €3.50 for the tapa portion, which was the size you would expect for a main course. 10% tax is added to the bill, along with a €1 service charge, but I still had change from €20. I liked the look of a lot more things on the menu too, such as the dumpling with sweet chili sauce and the courgette and truffle risotto. 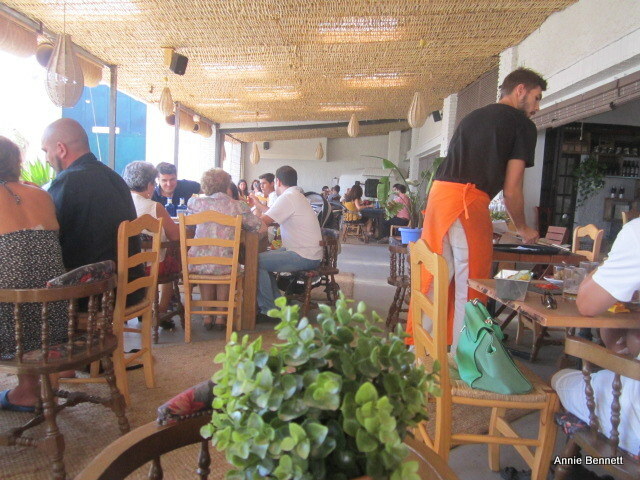 And I must go back to see what they do with traditional tapas like pescaíto frito, papas bravas and ensaladilla – not to mention have a few mojitos on the roof terrace. Paseo del Pedregal 1, Malaga. Tel (34) 951 253627, www.equipompuntor.com. Open all day every day.